This 3D map of Reunion shows the fascinating topography of the island. Reunion Island is a volcanic island in the Indian Ocean, east of Madagascar and southwest of Mauritius (map). 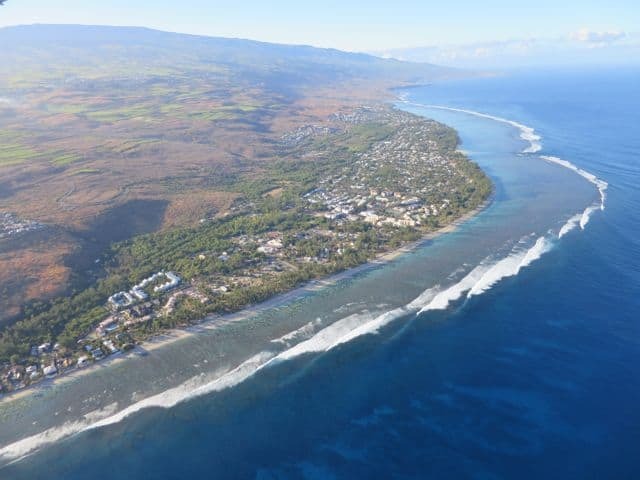 A French overseas department, Reunion Island is a wondrous place with a huge diversity of landscapes and micro-climates – measuring just 2,500 square kilometers, Reunion Island is home to a dry savannah, lush tropical forests and Mars-like volcanic plains. Its western and southern coasts are protected by stunning lagoons. From here, mountains rise gradually to dramatic, mist-shrouded peaks (several of which are more than 3,000m high) and ancient calderas. Due to Reunion’s unique landscapes and flora, about 40% of the island is a UNESCO World Heritage listed national park. 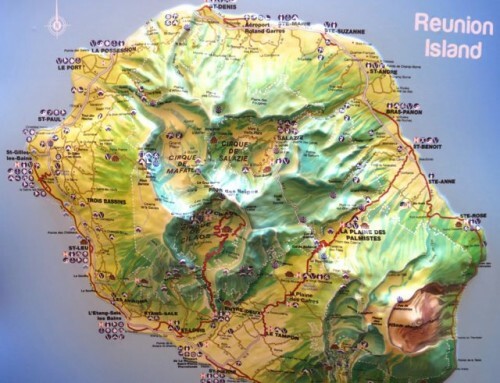 The best way to get a quick sense of the island’s spectacular topography is simply to purchase a 3D map upon arrival. This map shows the diverse landscapes on the island but the best way to view these amazing landscapes is, without a doubt, from the air! After several days of exploring Reunion Island and seeing its mind-blowing scenery, I couldn’t wait to see the island from above. My hosts had booked me on a ultralight flight with FelixULM and though I was very excited, I didn’t quite relish the idea of flying in a tiny, flimsy-looking aircraft at great heights. It’s absolutely safe, I was assured, but I was still rather jittery about the idea. One of the Felix ULM ultralight aircraft. We arrived early in the morning at the airfield near the port (Reunion’s main port is aptly named ‘Le Port’). I had a look at the planes and mumbled to myself that they looked perfectly fine. Nothing flimsy about them. Half an hour later, I climbed into one of them, with my pilot Pierre. I put on my headphones and strapped myself in tight in the tiny cockpit. The pilot offered to show me how to open the door… “when we’re up in the air, you can open the door for better photos”, he added. I shook my head nervously. “Errr, no thanks!”, I replied. The thought of being a few thousand meters up in the air with the door wide open sent a cold shiver down my spine. The take-off was short and swift. From the airfield, we turned inland towards the mountains. We were airborne in no time and made our way along the La Rivière des Galets, a river walled on both sides by towering mountains, and into the Cirque de Mafate, one of three ‘cirques’ or caldera-like formations formed by the collapse of the shield volcano. Each cirque is surrounded by majestic peaks and daunting cliffs, some of which are more than a thousand meters high. The plane hit some turbulence as we approached the mountains and I resorted to breathing exercises to calm my nerves whilst directing my focus to the view outside. And what a spectacular view it was! Over the mountains we went! We flew across the Cirque de Mafate past the Piton de Neiges, at 3,071 meters, the highest point on the island. The three massive cirques stretched out below me like three bowls in a triangular formation. Far below, I spotted verdant valleys, gushing rivers, a multitude of waterfalls and villages. The scenery was simply mind-blowing! A majestic view of Piton de Neiges. A stunning view of Cirque de Salazie. 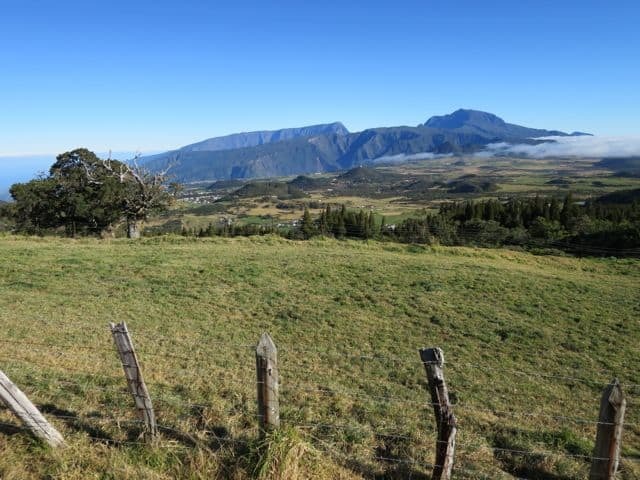 From the volcano, we crossed the plains again, this time in the direction of arguably the most spectacular cirque, Cirque de Cilaos. Framed by the two giant peaks of Piton des Neiges (3,071m) and Grand Bénare (2,896m), this cirque looks like a giant soup bowl from the air. 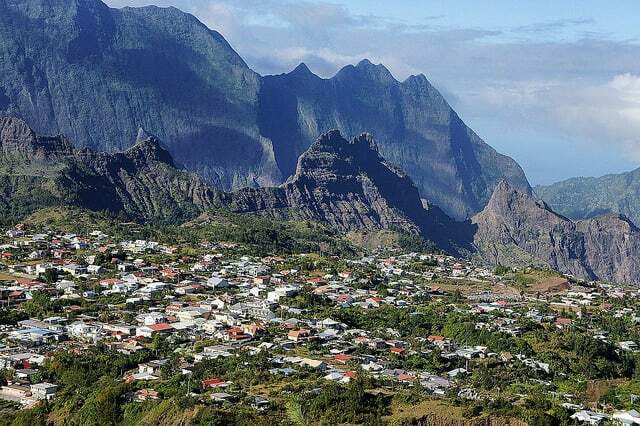 The village of Cilaos spread out like a little blanket at the foot of Piton de Neiges. It was an astounding sight! Approaching the magnificent Cirque de Cilaos. We circled around the peak of Piton de Neiges before continuing our way back into Cirque de Mafate and down to the west coast of the island. The west and southwest coasts, protected by the mountains and a series of lagoons, consist of a series of towns and villages interspersed by sugarcane plantations, beaches, coves and yacht harbours. I spotted hundreds of dolphins as we flew past the coast. Leaving the mountains behind us and flying down to the coast. The spectacular lagoon-fringed west coast of Reunion Island. The pilot insisted I opened the door and after a few moments of hesitation, I shoved my fear of heights aside, reached out for the lever and turned it. The door flew open and the wind began billowing in my face. There was nothing between me and the big, blue ocean several hundred meters below me! The gorgeous sight of the dolphins and the colourful lagoons helped to relax me somewhat. The town of St. Gilles les Bains. After more than 30 minutes in the air, we made our way back to the airfield and came in for a smooth landing. 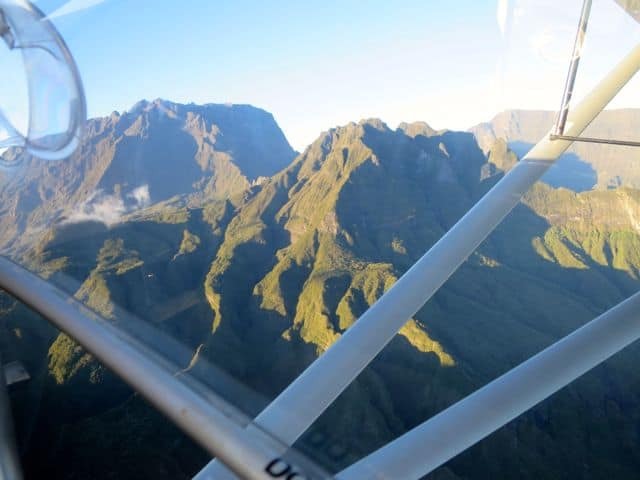 It was an awe-inspiring, albeit nerve-wracking experience; one that I would recommend to anyone as it truly is a spectacular way to see Reunion Island from above. Felix ULM runs frequent tours of Reunion in their ultralight aircraft and are located in Le Port on the island’s northwest coast. 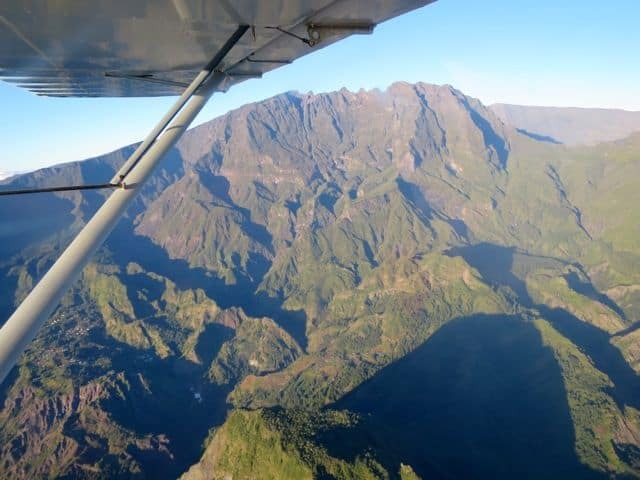 Read more about Reunion Island or check out aerial views from around the world in the Velvet Escape Plane Views series. Yes, I was there in late-June, early-July. Why? Hello Keith, may I ask which month you were in Reunion? July? Thank you. Hi Audrey, yep, it was freaky and I was seriously trembling when I finally opened the door above the ocean. Haha! This is reality of the nature..really mindblowing…wowwww…. Haha, so funny that the pilot was encouraging you to open the door mid-flight for better photos. I would have been terrified! 😉 Amazing views. Haha, it was a bit scary (for me anyway since I have a thing with heights) but I was strapped in tight to my seat so I wasn’t going to fall out for sure! The plane is sturdy but I guess due to its small size and weight, you do get bumped around quite a bit when it’s windy or when there’s an upward draft, as was the case when we flew over the mountains. The pilot said that this was very normal, which was reassuring, but he saw my nervous looks and chose a different (less bumpy) route. Haha! It felt fine flying over the ocean and along the coast. I guess I felt nervous because I’m not used to flying in small planes. Looking out and focusing my attention on the incredible scenery definitely helped! Wow the photos are beautiful I agree..seems a bit scary to open the door to take photos. How did you feel about the ultralight? Was it as sturdy as a conventional airplane?